The Buffalo Bills opened the season in Baltimore with an embarrassing loss. BALTIMORE, M.D. 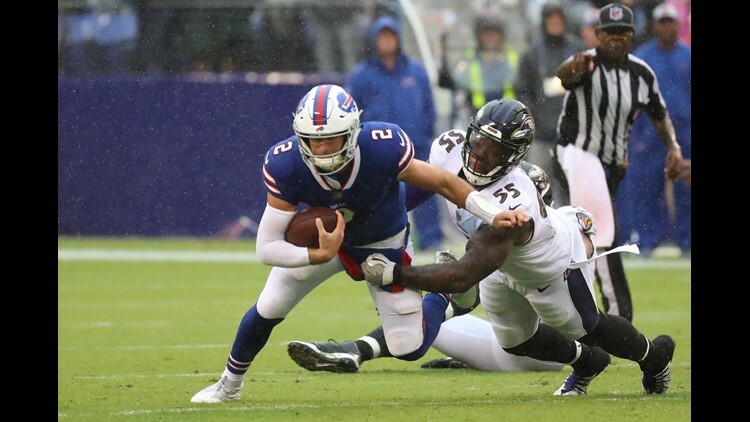 - The Buffalo Bills opened the season in Baltimore with an embarrassing loss. 8:42 - Ravens drive easily 80-yards in 10-plays on #Bills defense. Secondary shaky and not nearly the necessary pass rush. Flacco 5/6 for 80-yards. Baltimore leads 7-0. 7:42 - The Bills go three and out on the opening series that validated the concerns about the Buffalo offensive line. LeSean McCoy lost a yard on a running play. Nate Peterman threw incomplete, and then took a sack on third down. 6:25 - Bills defense forces punt on Baltimore's second possession. Buffalo with a drive start at its own 15-yard line. 5:43 - Bills offense goes three and out for the second time in the game. Peterman incomplete to Kelvin Banjamin on 3rd and 7. 1:32 - Ravens drive 66-yards in 10-plays. That included a 28-yard pass interference penalty on Buffalo. Joe Flacco capped the drive with a 7-yard TD pass to John Brown. 14-0 Baltimore. 13:42 - Baltimore's Justin Tucker with a 41-yard field goal after the Bills gave up a 51-yard punt return with the offense continuing to struggle. 10:15 - Bills Matt Milano commes up with a fumble recovery. Gives Buffalo the ball at the Ravens 36-yard line. 9:20 - The Bills come away with nothing after Stephen Hauschka comes up well short on a 52-yard field goal attempt. Nate Peterman sacked by Terrell Suggs on 3rd and 4. 5:43 - Nate Peterman's pass is intercepted by Tony Jeffferson on third down. Ravens with a drive start at the Buffalo 29. 4:19 - Justin Tucker with a 39-yard field goal to give the Ravens a 20-0 lead. :13 - Joe Flacco connects with Michael Crabtree to cap a 9-play 85-yard drive with a 12-yard TD. Ravens take a 26-0 lead into halftime. 12:23 - Joe Flacco hits Willie Snead for a 13-yard TD after an aborted play on a Bills punt. They take a 33-0 lead. 11:29 - Nate Peterman's pass is intercepted by Brandon Carr and returns it to the Buffalo 1-yard line. 11:22 - Javorius Allen scores a one-yard TD. Ravens lead 40-0. 2:38 - With rookie quarterback Josh Allen in the game, the Bills go 46-yards in 12-plays and settle for a field goal. Allen was 1/14 for 14-yards and was sacked three times. 3:52 = Ravens with a 13-play 89-yard drive for a touchdown. Ravens lead 47-3. Nathan Peterman finishes the day 5 for 18 for 24 yards. No TD's 2 interceptions. Josh Allen finishes the day 6 for 15 for 75 yards. No TD's. No interceptions. Each quarterback was sacked 3 times. Bills are 0-1. Home Sunday against the LA Chargers.